Thirty-two migrants were treated in hospital for minor injuries after pushing their way through two gates just before 2 a.m. local time, while three Spanish policemen also needed medical attention, the government said. 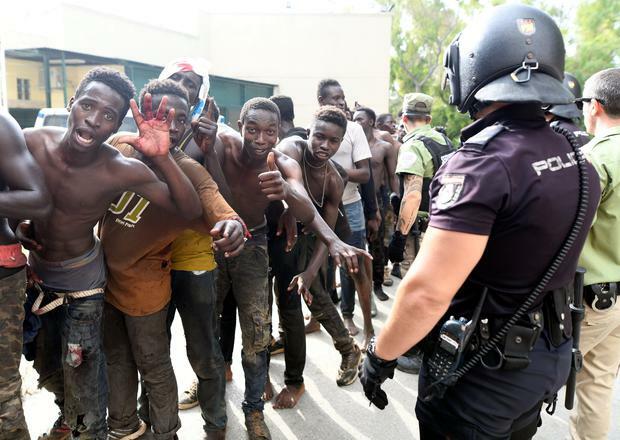 The Guardia Civil said seven policemen were burned by acid and quicklime, a skin irritant, allegedly thrown by some of the migrants as they over-ran border defences. Several migrants collapsed from exhaustion after crossing into Spanish territory, Reuters photographs showed. Their legal status in Spain has yet to be determined, and police were searching for some who fled into hills inside the territory, it said. Spain’s two enclaves in Morocco, Ceuta and Melilla, have been favored entry points into Europe for African migrants, who either climb over their border fences or swim along their coastlines. After thousands crossed over in 2014 and 2015, Spain stepped up security, partly funded by European authorities, and passed a law enabling its border police to refuse refugees the opportunity to apply for asylum. Since then Libya has become a more common departure point for African migrants, most from sub-Saharan countries, who attempt the crossing to Italy in rickety boats that often break down or sink. More 3,740 migrant deaths have been recorded this year in the central Mediterranean, most along that route.